← En sanningskommission för romer i Sverige? This Friday CMES will organize an extra added brown bag at 12.00 i L-201 with Josh Philips. 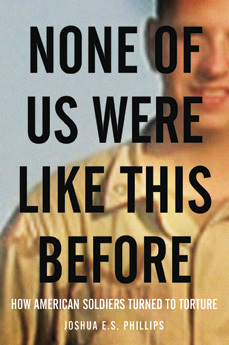 Josh Philips is a journalist and producer and recently published a book titled, None of Us Were Like This Before: American Soldiers and Torture, which examines how US forces turned to torture, and the unrecognized costs of torture on detainees as well as the perpetrators themselves. The book was recently reviewed and ranked as one of the top books on violence by Darius Rejali on Five Books. Don’t miss this unique opportunity ! Sandwiches and drinks are served as always. This entry was posted in Events, Lectures. Bookmark the permalink. War on Iran in 2012? We Love Hip Hop, But Does Hip Hop Love Us? Critical human rights studies vs. human rights monitoring and activism? Brister i intervjuprocessen – ett hot mot personlig säkerhet?